Guitar Center Professional’s upcoming technology seminar in the Chicago area on September 9, 2015. WESTLAKE VILLAGE, CA, August 12, 2015 — Guitar Center Professional (GC Pro), the outside sales division of Guitar Center that focuses on the needs of professional users, is holding a series of seminars across the country focused on audio, video and lighting for house-of-worship facilities. The event serving the Chicago area will take place in Palatine, Illinois, at New Life Church (1200 W. Northwest Hwy.) 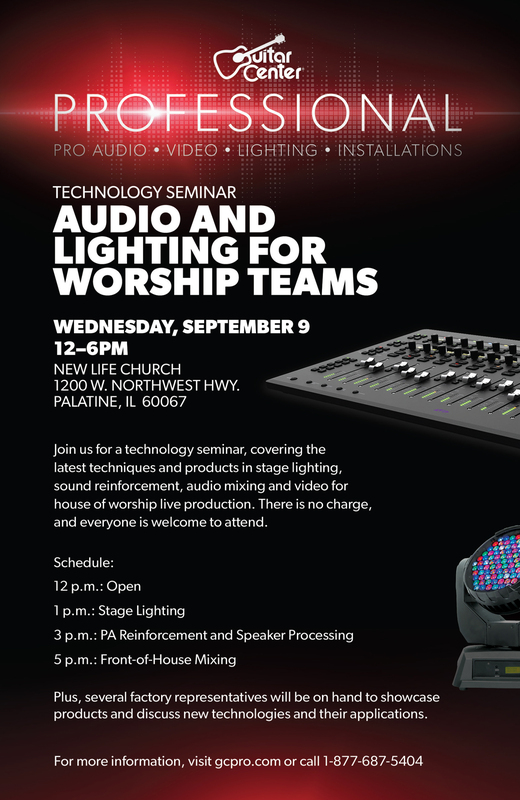 on Wednesday, September 9, 2015, from 12 p.m. to 6 p.m.
Join us for a technology seminar, covering the latest techniques and products in stage lighting, sound reinforcement, audio mixing and video for house of worship live production. GC Pro personnel, including account manager Paul Johnson, will be on hand to lead the event and answer questions. There is no charge and everyone is welcome to attend. For more information, please visit http://www.guitarcenter.com/GC-Pro-House-of-Worship-g28238t0.gc. Photo caption: Guitar Center Professional’s upcoming technology seminar in the Chicago area on September 9, 2015. Guitar Center Professional is the outside sales division of Guitar Center that focuses on the needs of professional users. Its clientele includes recording studios, audio engineers, producers, recording and touring musicians, live sound venues, post production facilities and more. Emphasizing extraordinary individualized service via local account managers, GC Pro offers expert consultation and a comprehensive selection of the world’s finest equipment for music and audio professionals. More information on GC Pro can be found by visiting www.gcpro.com. Guitar Center is the world’s largest retailer of guitars, amplifiers, drums, keyboards, recording, live sound, DJ, and lighting equipment. With more than 260 stores across the U.S. and one of the top direct sales websites in the industry, Guitar Center has helped people make music for more than 50 years. In addition, Guitar Center’s sister brands includes Music & Arts, which operates more than 120 stores specializing in band & orchestral instruments for sale and rental, serving teachers, band directors, college professors and students, and Musician’s Friend, a leading direct marketer of musical instruments in the United States. With an unrivaled in-store experience, an industry-leading online presence and passionate commitment to making gear easy-to-buy, Guitar Center is all about enabling musicians and non-musicians alike to experience the almost indescribable joy that comes from playing an instrument. All we sell is the greatest feeling on earth. For more information about Guitar Center, please visit www.guitarcenter.com. You can subscribe to our RSS newsfeed at http://feeds.feedburner.com/GuitarCenterPressroom, visit our press room at http://gc.guitarcenter.com/pressroom/ and send media inquiries to media@guitarcenter.com.